You are here: Home / Get to Work in a Job in Spain in 2019 – The Honest Truth About Working in Spain… / Get a Job in Spain as an Au Pair or Nanny – Want to Find a Nanny or Au Pair? Get a Job in Spain as an Au Pair or Nanny – Want to Find a Nanny or Au Pair? If you have been searching for work for some time you would have realised that it can be quite difficult to find work without actually being in Spain itself. One of the very best ways of finding work and jobs in Spain in advance of moving to Spain is getting a position as an au pair or nanny. Certainly if you are a young female who likes children this represents a fantastic job opportunity for you. This article will answer all your questions about working in Spain as well as helping you to find work itself. The advice and tips on this page would also apply if you are looking for childminding and childcare work in Spain, work as a housekeeper or babysitter in Spain. Are you reading this page because you are looking for a nanny or au pair? You can place a free advertisement at the bottom of this page for childminders, babysitters, nannies or au-pairs. Your vacancy or position must be in Spain. Please provide as much information and details as possible in order to help the applicants, be clear on what you are looking for and expect. In addition to wages you are normally expected to accommodate your nanny/au pair as well as provide meals. Be clear if you wish your nanny or au pair to perform any other duties other than looking after the children, for example housekeeping chores. An au pair or nanny is a girl or woman who helps and assists a family by looking after their children. Although this is primarily a childcare role it can also involve an element of housekeeping or housework. It is also normal to board or live with the family you are working for. In most cases you will be treated as one of the family. If you are searching for work as a housekeeper in Spain then typically this would just involve a position whereby you were looking after a house in terms of maintenance and cleaning as opposed to actually looking after children. In some countries the term nanny (or nannie) is defined differently to au pair in that a nanny is someone who has professional childcare qualifications as opposed to an au pair who doesn’t have any qualifications. For the sakes of this article we don’t distinguish between the two but if you are a responding to a job advertisement then you should be aware of this. Spanish Nanny Jobs – What Qualifications Do I Need? No formal qualifications are necessary and you will not need a visa if you are an EU citizen. In this instance you will be allowed to be employed for as long as you or your host family wish to employ you. Non-EU citizens will need a visa and depending on what nationality you are, you will need to check the current regulations with your embassy or consulate. The standard regulation is that you will be allowed to stay up to 3 months in Spain and you will need to enroll in a course to learn Spanish before arrival. It is important that you realise there is a lot of competition for each position that is advertised by a family in Spain. Therefore how do you give yourself the advantage over other people who also seek the same position you do? The most important aspect you can focus on is the family’s concerns about the well-being of their children. Their kids are their most precious thing in the world and they will be very concerned or worried about who they are entrusting their child’s safety to. If you can reassure the host family of your reliability and trustworthiness, you will be in a good position to get the job. Clearly references would play a large part in establishing your credibility and reliability from previous employment with other families. Of course if this is your first job as a nanny or au pair you are at an immediate disadvantage over others with more experience. Providing as much information about you and your interests as well as photos will give a better overall picture of you and your personality to the host family. In addition it would also help you to gain an advantage if you speak fluent Spanish or at least conversational Spanish. Most families looking to employee nannies and au pairs in Spain will be Spanish but there will also be a number of expat families where you won’t necessarily need to speak any Spanish. Working for a family usually involves a relatively short-term contract for just a few months. Often this is so the family can get to know you without being overly committed in case they change their mind. In many cases as you become part of the family and the children become more and more attached to you, the family typically will want to extend your contract and keep hold of you for as long as they can! If you are happy you could even continue working for the same family for years although after some time it is likely that you will want to move on. Let us not forget that you will generally be living with the family and will want to move on and have your freedom. It is clearly very difficult to start long-term relationships when you are working as a nanny and au pair. These types of positions are best viewed as a great working/life experience and opportunity to travel the world while getting paid at the same time. If you are really lucky and you are a student looking for nanny/au pair work for the summer, you may just find a vacancy for the period which coincides with your summer holidays. Even better, you might just find a family who vacation each year for the summer in Spain! Believe it or not this does happen because many wealthy families like to spend their summers in Spain but they want to relax and have somebody to look after their children so that this is possible. How Much Can I Earn as an Au Pair or Nanny in Spain? The question of how much you will be paid to work in Spain as an au pair or nanny is the question most frequently asked of us. Of course there is no one answer but we certainly can give you a guide, which is on average €200 per week. Although it looks like you are very lowly paid, these types of positions to come with a lot of living expenses included. If you were to looking for other work in Spain such as bar work or teaching jobs in Spain then you would also be very poorly paid but you would then need to find accommodation which certainly won’t be cheap, whereas when you work as a nanny or au pair you are usually living with your host family and so you don’t have any rent, utility bills or food bills. Your family will also usually ensure you have private medical care whilst in their employment. If you are a United Kingdom citizen you should certainly apply for the EHIC card which will entitle you to emergency medical treatment while in Spain. Although you will be getting paid for the work you do, you may wish to also take additional spending money for any time off that you have from the family although this is usually very rare. Obviously your host family will not be expected to pay for your personal spending when in Spain. What Do I Have to do as a Nanny or Au Pair? This is very much an individual question and will vary from family to family. Most jobs will be live-in but some jobs will involve you just working from Monday to Friday while the mother and father are both at work. Some families would employ you only to look after the children while someone else does the housework. Other families would expect the nanny and au pair to perform other duties in between looking after the children. Typically these would include cleaning, chores, schooling, looking after pets and doing the shopping. Most problems or misunderstandings that arise can be avoided in our experience by making absolutely clear what your duties are to be. If in doubt talk to the family so you know exactly what is expected of you. Try to get this in writing to avoid any disputes in the future. Do I Need an Employment Contract With My Host Family? Having a written agreement between the two parties is not only common sense but highly recommended to avoid any misunderstandings. Items that would be in the contract would be the length of employment, your salary, your duties, your weekly working hours and a notice period for both parties. This is a very difficult subject because of the potential of fraud and being scammed. It makes sense that the family do not send any money in advance for travel costs in case they are being scammed. Therefore you should be paying for your travel costs and then when you arrive in Spain the normal procedure would be for the family to reimburse you by adding your travel costs to your wages. Where Can I Find Job Vacancies in Spain? Obviously you will find on the Internet a number of nanny and au pair agencies who specialise in introducing potential nannies to families who live in Spain. 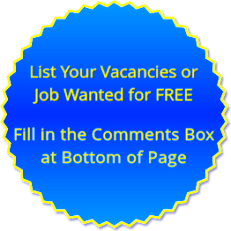 We also offer a free listing service below at the bottom of this page where potential employees and employers can contact each other. Other situations vacant can be found in the classified advertisement sections in Spanish national and local newspapers. Vacancies may be in any parts of Spain you are more likely to find vacancies in the major cities of Spain where often both parents go to work. These cities would include Madrid, Barcelona, Valencia, Seville and Malaga. Other popular areas of Spain tend to be the areas that have attracted the most expat families such as the Costa Del Sol where many wealthy families live in towns and cities such as Marbella and Puerto Banus. Costa Blanca is another popular region with many expatriates as are islands such as Ibiza and Mallorca. Easy Au Pair – International Au Pair And Nanny Job Site. Being Au Pair in Spain is a great opportunity for young people between 18 and 30 years old to improve their Spanish whilst living with a Spanish family in Spain and helping out in looking after their children. We offer stays during summer time and school year. No Spanish skills are required. Working as an Au Pair is the best way to discover Spain and learn their culture and language. During your stay, you will have time to attend Spanish classes and practise Spanish with native speakers. Your main responsibilities as an Au Pair are to care for children and play a tutor role, speaking and playing with them in English. In return you will receive full board lodgings and a weekly allowance as pocket money. The weekly salary will be agreed depending on the number of working hours. As per reference, Au Pairs in Spain are normally paid a minimum of 70 Euros a week when working a 30 hour week plus full board lodging. Au Pair placements start from as little as 1 month, but the length of stay is flexible and depends on yours and family preferences. Do you want to advertise for free your vacancy for a childminder, babysitter, nanny or au pair in Spain? Au pairs and nannies wanted in Spain? Host families wanted in Spain? Do you want to list your job wanted as an au pair or nanny in Spain? Simply fill out the comments box below – note that any personal information you type WILL be published and publicly available for all to see. I Hate Spain – Shocking Opinions! We also have our Spanish Job Prospects Section. My name is Celine and i’m from Belgium. I’m trained as a pediatric nurse and i’m looking for a new adventure. I have several years of work experience with children (with or wihtout special needs). I’m looking for a job for 3-6months. It would be a positive note if the job would be in the south of Spain. I’m looking forward to hear any feedback! I am looking for a live out or live in position in the south of spain for about 6 months. I currently live in a madrid as a nanny and have been with the same family for two years now i have worked with children just short of ten years, in all childcare settings. While i love them all dearly i feel i need to explore some more of spain. i alos have family in the south. I am looking for a position to start in September. i can send CV and Refrences are available on request. We live in sitges, Barcelona. We have 2 kids under 6yr old. Please let us know if you are available and we can talk further. I’m Michelle, I worked for two years with a family and I took care of the kids as well as cleaning the house. I want a full time live in job as a nanny for a year or two depending on my agreement with my employers…I hope to get a response soonest! Thanks! I’m currently in ELVIRIA and I’m looking for work. I have 5+ years working with children in the nursery and at home. I also have 2 years care experience with special needs children and young adults. Let me know if you know of a fit! My name is Jess and I am 25 years old from a lovely city on the Coast on Devon in England. It is a beautiful city and I have worked with children here for 8 years, however I am now looking for the opportunity to explore a new place and work with new people. I would love the opportunity to be an aupair to a family in spain as I love the country and its culture and would love to share my knowledge with them. My name is Michelle I first came to Spain in 1994as an au- pair. I have since been a carer for the elderly, of which was my main job in England. I enjoy the life of children watching them learn and play. I live in Spain permanently and would be seeking a live out position. I’m currently on the coast at riviera del sol. Look forward to any feed back. I currently live in Marbella and I am a home school teacher for children age 3 to 8 years of age. I am looking for a part time job for the summer holidays. I am a qualified English speaking teacher and have aupair and babysitting experience.